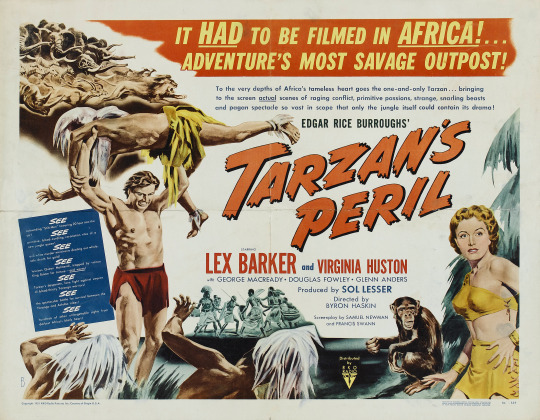 This is the first Tarzan film to have been shot on location in Africa and not just use stock footage. It was also a film whose shoot was filled with troubles such as too much overcast so that Lex Barker's tan disappeared, the corruption of a good chunk the color film so it had to be released in black and white and the weather being such that Cheetah was not being cooperative and had to have his part greatly reduced. The result, in my eyes, is one of the more exciting films in the series. This time out Tarzan is pitted against an old foe, a man named Redijeck a gun running slaver who managed to arrange his escape from the gallows. Along the way he manages to kill both the old and new commissioners and cause all sorts of havoc when he puts his guns into the hands of a war like tribe. Tarzan life is of course in danger as he tries to run down the bad guy who hates not only Tarzan but Jane as well. The longest film in a several entries the film is nicely given room to breath. I don't think Tarzan even appears in the film for ten or fifteen minutes as the film lays out the situation in the jungle and who all of the new characters are.I like that nothing feels rushed, that we given time to get acquainted with this world and the positions of all the players. I especially love how the lack of Cheetah works to the films advantage with the humor kept to a minimum. This is a film fraught with danger and there is no humor to take the edge off things. In reading on the film at IMDB and some other message boards there was some grousing that the plot line isn't entirely new but is essentially a stock western plot. Perhaps, but to a large degree not only all western plots are stock, most film plots are and it's only the dressing that makes the difference. Here the dressing is a bunch of location shooting. To be sure there is a a lot of studio shooting as well, but the stuff shot on location in Kenya is a major plus. Its nice not only to see Tarzan and Jane in actual locations, but its nice not to see the same jungle sets for what seems like the 100th time. The film marks Virgina Huston as the third Jane in as many films and for the most part she really has nothing to do. After Brenda Joyce carried over from the Weissmuller films and was a key player in the action in MAGIC FOUNTAIN and Vanessa Brown was in SLAVE GIRL, Huston does very little except end up in peril in the final moments here. While she is convincing in conveying the real terror at seeing Redijack again, she doesn't do anything other than just hang around. Granted she is barely in the film to begin with but she could have been cut out with no loss to the story. For me the film is one of the most tense in the whole series. George Macready as Redijeck is pure evil, You really get a sense of how vile he is. You completely understand why Tarzan hates and fears him. There is a sense of danger that he brings to everything that caries over to the action sequences. And if his sole mistake is not shooting Tarzan outright but allowing him to be tossed into a river unconscious, you still feel that maybe this time Tarzan won't come out of it. This is a super film and a must see for anyone who loves adventure film.